Aurora has the perfect features for industrial applications like commercial manufacturing shops where surfaces are flat. The main feature that makes using the sweeper easy is the debris clean off feature. The debris handle drops debris off of the sweeper with a quick and easy pull of the debris release handle… no lifting or bending over. It is also available in a narrower 19 inch sweeper width to manoeuver around shop equipment in a smaller shop environment. This sweeper has a medium pickup power and a fixed sweeping height of 1 1/4″. Not every sweeper has to be the biggest and baddest, it just has to be perfect for the application. Drop debris with a quick and easy pull of the convenient debris release handle, no lifting or bending over. The release of the material from the magnet works excellent. "We are very pleased with our purchase of the Aurora 19 magnetic sweeper and can’t believe what we have been driving over in the driveway around our farm shop and equipment buildings. The magnet was easy to assemble and just as easy to use. The release of the material from the magnet works excellent." Perfect balance of features for commercial manufacturing shops. 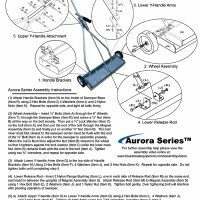 The Aurora has everything it needs to perform well in commercial manufacturing shops and it includes nothing that is not necessary for this application. It is designed to perform well on surfaces other than grass such as gravel, concrete and pavement. So it does not feature the “Wrap Around” design which is necessary for grass but not for flat surfaces. 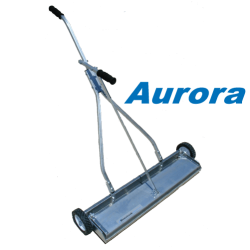 The Aurora has one single sweeping height. The single sweeping height is all that is required for flat commercial shop floors where adjusting the sweeping height would not be used. The single sweeping height is set very low 1.25″ so that it easily picks up everything on flat surfaces. The easy clean off feature makes cleaning the debris off the sweeper easier with no bending over. This features also makes cleaning off debris faster. 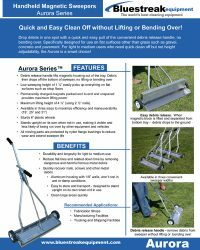 The Aurora is durable and sturdy featuring the 3 piece Y handle design and all weather aluminum housing that won’t rust in damp or wet conditions. 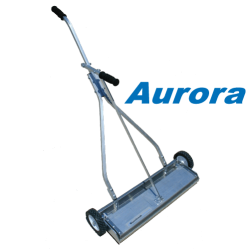 The Aurora has a medium power pickup because most shops have normal debris requiring a medium powered magnet with no need for a bigger more powerful magnet that would add unnecessary weight and make using it more tiring. It also features a smaller width. The sizes include 31″ 25″ and a the smaller 19″ model. The smaller width option is great for manoeuvering around shop floors and in-between equipment. Sturdy “Y” type handle design adds stability and durability. 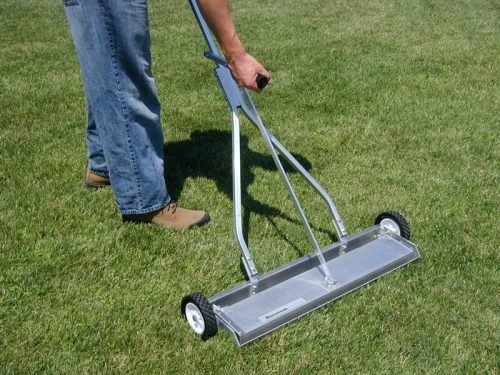 The sweeper also stands up-right on its own so that it is easy to store and transport. Permanently charged magnets packed end to end and un-spaced. Debris Release Handle lifts magnetic housing out of tray so the debris drops off the bottom of the sweeper. No lifting or bending over to remove debris from the sweeper. Permanently charged magnets for greater magnetic field and lifting power. Available in 3 sweeping width sizes 19", 25" and 31". Rugged Durability. All moving parts are protected by nylon flange bushings and reduce wear and extend sweeper life. Maintenance free all weather aluminum housing with 1/8″ walls, won’t rust in wet or damp conditions. So far I like the mag broom. It feels well made and sturdy. I’ve had a couple of other styles in the past. This one seems to be the best design so far. Thanks. 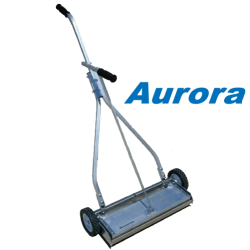 We are very pleased with our purchase of the Aurora 19 magnetic sweeper and can’t believe what we have been driving over in the driveway around our farm shop and equipment buildings. The magnet was easy to assemble and just as easy to use. The release of the material from the magnet works excellent. The wood packing crate arrived in excellent condition and you shipped it out fast to us.